This Champions of Hara review was made after playing the game eight times. Champions of Hara is a fantasy adventure game in which your characters get to explore a unique world and use their abilities to defeat monsters and deal with events that pop up. The game has a competitive Versus Arena mode as well as 18 scenarios you can play through. In the Versus Arena mode players are racing to fill their energy bars, and in the scenarios players are usually working together to try to complete challenges and defeat powerful villains. Champions of Hara was designed by Walter Barber, Ian VanNest, and Andrew Zimmermann, and it is published by Greenbrier Games. Most of the rules for Champions of Hara are the same regardless of game mode. You’ll play through a maximum of six days, and each day has a Dawn round and a Dusk round. 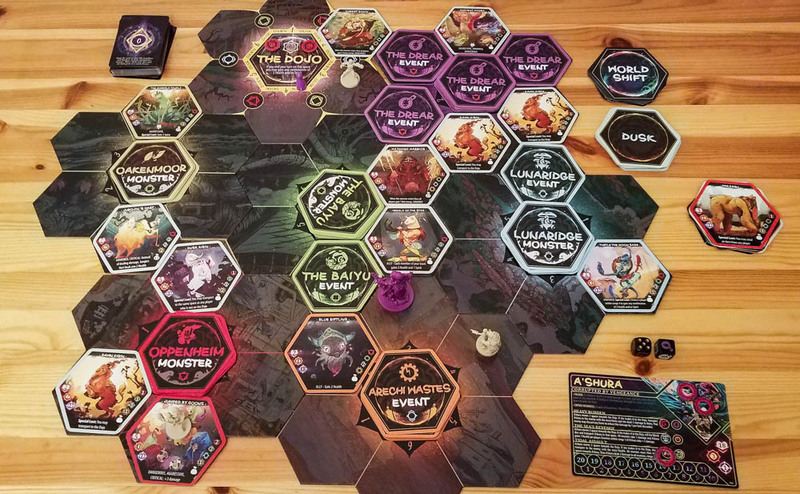 During Dawn more monsters and events will show up on the six World tiles, and during Dusk rifts will open up and monsters will show up in random areas. You’ll also draw World Shift cards between days, which physically change the map. Each character in Champions of Hara has a unique deck of cards, which includes four core cards, some Level Up cards, and an Ultimate ability. Each character also has a unique resource that they will be using throughout the game and a preferred type/color of energy. Your player board tracks your character’s three energy levels, their health, and their Spirit. Spirit is what you’ll use to mitigate your dice results during events and when closing rifts. A lot of the characters’ cards use their unique resources. For example, Persephone gains Fear every time she takes damage and will often use her fear to power up her abilities, while Thomas gains Runes by closing rifts and uses those Runes to empower some of his abilities. 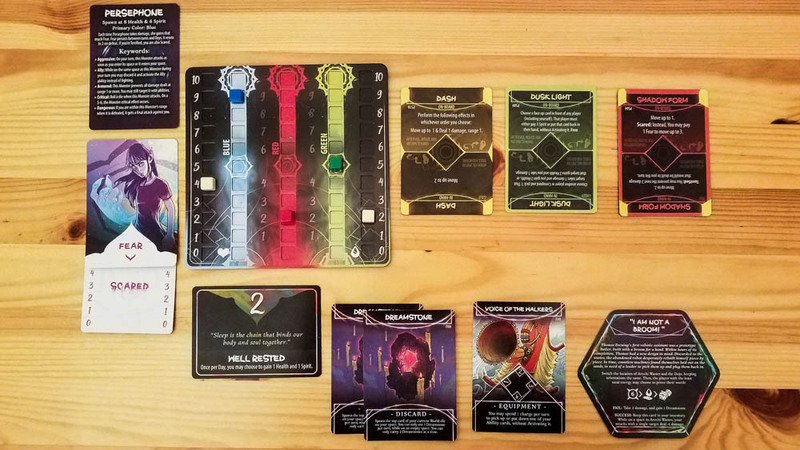 Throughout the game you’ll be using your character’s cards to move around, fight monsters, interact with events and rifts, and build up your energy. Each round you’ll be able to activate three abilities, and you can even give one of your activations to a teammate (in the co-op scenarios) so they can help you defeat a monster. Besides Ultimate cards, every card has an “In-Hand” and “On-Board” ability. You’ll first play a card from your hand using its In-Hand ability and in a later round you can use its On-Board ability, which will put the card back into your hand. Each time you reach energy thresholds, you’ll be able to level up by adding new cards to your hand. There are multiple ways you can gain your Ultimate ability, including when you reach the maximum energy level in your character’s preferred energy type. Combat is very straightforward. If you’re within range of an enemy, you simply compare your ability’s attack (plus any modifiers) to the enemy’s health. If you defeat an enemy, you’ll gain energy and possibly other rewards, which could include powerful items. The enemies get to attack you if you are within their range at the end of your turn, and they might also have abilities that allow them to attack you at other times. In the Versus Arena mode, you’re racing to be the first to max out all three of your energy tracks and make it back to the home base (the Dojo). In the scenarios, you’re usually trying to work together to defeat one of the three Corrupted, who are powerful villains with their own special abilities. There are 18 scenarios (three for each champion), each with its own unique set of rules that change up how the game is played. You can also play through a Story Arc, which is one Versus Arena game and two of the winning champion’s scenarios. When you beat a scenario, you’ll unlock a Progression Reward for a character that they’ll be able to use in all future scenarios. You can also add Quests (any game mode) that give players rewards for completing their own personal missions. If you want to see all of the rules for the game, check out the official Champions of Hara rulebook (PDF). I’m always happy when designers go all-out to create unique fantasy worlds. It’s obvious that a lot of work went into creating Hara and the characters’ backstories. All of the characters feel very different thanks to those unique decks of cards and the fact that they use their resources in different ways. It definitely helps to make you feel like you’re powerful in your own way. I’m a huge fan of this type of action-selection system. You’ll sometimes want to get a card on the table just so you can use its On-Board action in a future round, but you can only take three actions per round so it creates some tough decisions. The shifting-world mechanic is also very cool. Not only is it a clever way to force players to come up with new strategies on the fly, it also works thematically as the world you’re on is very unstable. All of those unique scenarios keep the game fresh. Some of the scenarios change up setup, some add in more Corrupted, and some will add in additional objectives that you need to complete. Champions of Hara has a great look to it. Both sides of the World tiles look nice, the character art is excellent, and the miniatures are fantastic. Earning those Level Up and Ultimate cards is very satisfying. I really like the fact that you don’t have to replace one of your cards when you gain a new one like you do in many other games. It’s pretty awesome that you can give a teammate an activation on your turn. Sometimes it’s the only way you can defeat some of the tougher enemies. I don’t find the Versus Arena mode nearly as interesting as the scenarios. It’s still a solid game as you race each other to get energy, but I definitely prefer having the Corrupted in play and trying to complete objectives. Some of the abilities on character cards and other cards were designed for the competitive game, such as the abilities that let you steal energy or Spirit from other players. I wish there were replacements included for the solo and co-op scenarios. It can be difficult to track what you’ve done on your turn, especially once you get to the mid-game. You’re rotating a lot of cards and sometimes combining cards’ abilities on your turn, so it can get confusing. Those World tiles take up a lot of space. I think they could have made the tiles (and the cards that go on them) a couple of centimeters smaller without negatively affecting the experience. There’s quite a bit going on during each “day” in this game, especially when playing scenarios, so I’m surprised they didn’t include a rules overview/reference either on cards or on the back of the rulebook. One of the designers did post a Turn Order Guide on BGG, which I highly recommend printing out if you get the game. I’ve had a really good time playing Champions of Hara. It has a great look to it, it has six very cool characters, and the scenarios and monster/event/rift randomness make each game play out differently. 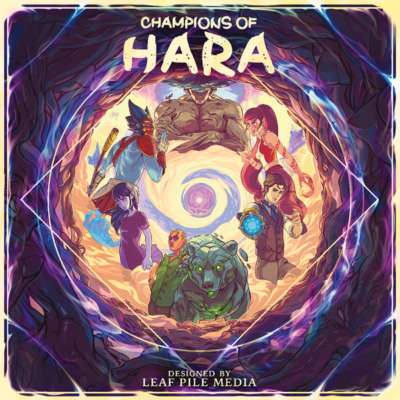 I don’t know that I’d recommend Champions of Hara if you’re only interested in the competitive mode, but I’d definitely recommend it if you like fantasy co-ops, unique puzzles, and/or games that allow you to have asymmetric powers (like Spirit Island). Thanks for taking the time to read our Champions of Hara review! 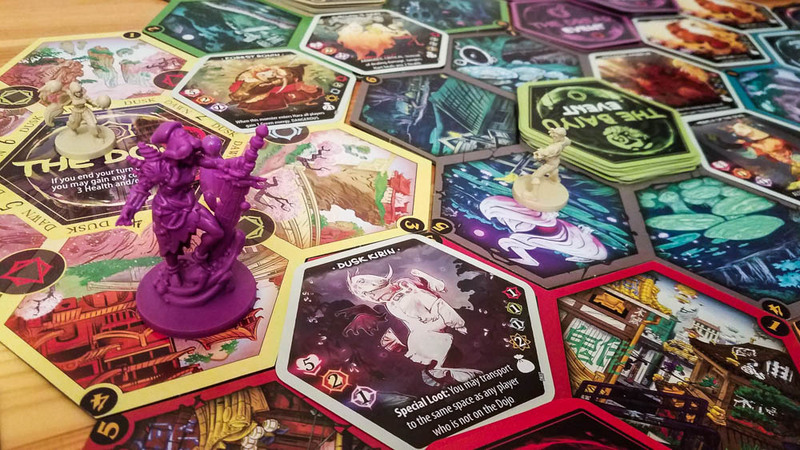 To stay updated on all things cooperative board games, follow us on Twitter, Facebook, or via RSS.